On the eve of Valentine’s Day 2015, Sea Shepherd Conservation Society held its second annual “World Love for Dolphins Day,” attended by thousands of people at peaceful demonstrations at Japanese embassies and consulates across the United States and overseas, raising their voices in a call for compassion and an end to the brutal capture and slaughter of dolphins in Taiji, Japan. The demonstrations led by Sea Shepherd USA chapters were held in 15 U.S. cities, including Los Angeles, New York, Washington, D.C., and Seattle, and international demonstrations were held by Sea Shepherd volunteers in countries overseas including Australia, Canada, New Zealand, Brazil, Chile, Denmark, the Netherlands, Hungary, Ireland and Mexico. 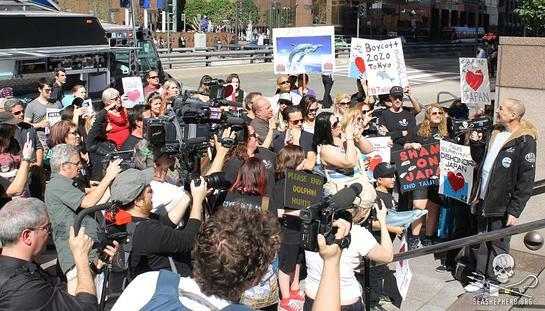 The events were well attended by protesters and the media including the Associated Press, APTV, Reuters, ABC, FOX and more, drawing international attention to the atrocities committed in Taiji’s infamous killing cove. In Los Angeles, Calif., a group of more than 200 people rallied together, marching around the plaza in an event live streamed to the world on Sea Shepherd’s website. Celebrity Sea Shepherd supporters and special guest speakers joined the demonstration, including actress Shannen Doherty (Beverly Hills, 90210 and Charmed), Sam Simon (Co-Creator, The Simpsons), and Simone Reyes (star of Running Russell Simmons and Director of TV Development, Def Pictures Television). All three have traveled to Taiji to join Sea Shepherd’s Cove Guardians on the ground, and spoke today of their experiences witnessing and documenting the horrific hunt firsthand. Other speakers included actors Eric Balfour (Haven) and Ross McCall (star of Band of Brothers and White Collar). McCall traveled to the Faroe Islands last summer to defend pilot whales and other small cetaceans as part of Sea Shepherd’s Operation GrindStop 2014. Sea Shepherd Youth Ambassador, actor Zach Callison (Kingshighway) also said a few words. Many young supporters attended the demonstrations with their families, and children spoke to the crowd, emphasizing the importance of protecting the oceans for future generations. In Washington, D.C., a crowd of approximately 70 people braved the cold to make the 20-minute march from the DuPont Circle Metro station to the Embassy of Japan, not letting the freezing cold weather stop them from speaking up for the dolphins. 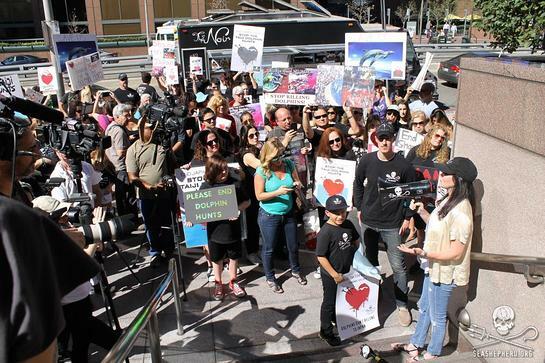 Several of the 32 “World Love for Dolphins Day” demonstrations had 100+ people in attendance. Sea Shepherd attempted to deliver a letter written by Senior Cove Guardian Campaign Leader, Melissa Sehgal to the Japanese Embassy in D.C. and Consulate in Los Angeles, but was denied permission to do so at both locations. Just as the dolphin killers in Taiji attempt to hide their cruel deeds behind tarps, representatives of Japan did the same behind the walls of the Embassy and Consulate today, refusing to even accept a letter on behalf of the dolphins. In Washington, D.C., the only individual from the Embassy to come outside during the protest, was a man who photographed the crowd of peaceful protesters from atop the roof, quickly leaving when he was noticed and photographed. “Japan continues to falsely claim that the brutal drive hunt in Taiji is a long-standing and proud part of Japanese ‘tradition’ and ‘culture,’ but if that were the case, there would be nothing to hide. It is purely about greed, but today thousands of people joined Sea Shepherd and showed Japan that the world’s love of dolphins is far stronger than the killers’ love of profit,” said Sehgal. For a staggering six months of each year, from September 1 until March, entire families of dolphins and small whales are driven into Taiji’s killing cove. Once netted within the shallow waters of the cove, their fate is sealed and the members of these doomed, frightened pods will face either imprisonment in captivity or brutal slaughter before the eyes of their families. Killers and trainers work side-by-side to select the “prettiest” dolphins and whales for captivity, those without visible scars. The others are mercilessly stabbed with a metal spike inserted into their backs, just behind the blowhole, to sever their spine. The dolphins slowly and painfully bleed to death or drown in the blood of their family — others may die as they are dragged to the butcherhouse, where the once living and free cetaceans are processed into meat for human consumption, despite being heavily contaminated with mercury and other toxins. These inhumane killings would not be allowed in any slaughterhouse in the world. Japan refuses to sign on to many protection efforts and regulations for marine mammals, despite most of the world recognizing the need to protect these self-aware, beloved and imperiled animals. Sea Shepherd Conservation Society first brought the cove to the world’s attention by capturing and releasing now-iconic footage and imagery of the brutal hunts and slaughters in 2003, during which the cove turned a blood-red. Later the Academy Award-winning film The Cove again shone a spotlight on the hunts, bringing worldwide attention to the killings. Many individuals thought the film succeeded in bringing an end to the hunts, but that was not the case. So in 2010, Sea Shepherd established Operation Infinite Patience and our volunteer Cove Guardians took up positions alongside the cove to document, report and live stream these atrocities in the hope of capturing attention to bring pressure to bear to stop these barbaric acts. Sea Shepherd is the only organization to have a team on the ground in Taiji each day throughout the entire six-month killing season, and the only group who live streams every capture and every kill for the world to see. Sea Shepherd’s Cove Guardians will not stop shining a light on this atrocity until the slaughter ends.